I stumbled upon this nice blog post – pipable functions in C++14. This is realy fun idea as its usage plain for anybody who is familiar with unix pipelines. So i tried to use it in C++11 (without boost) from slightly different angle to make it more real-life concept. This entry was posted in C++, C++11 on 19 January, 2015 by Victor Laskin. Very often i hear from java/erlang/etc people that C++ is so bad that it is very unwise to use so-old-school language now, when we have more ‘safe’ higher level languages. Everybody heard about foot-shooting using C++. What about C++11? Bjarne said that C++11 feels like whole new language and, at first, i did not take it seriously as modifications looked more as minor additions (especially for boost users). Now i changed my mind – using new features combined together can transform your way of coding into new form. I’m talking not about adding new features to your code, but about changing your coding style. How not to shoot yourself in the foot? Here is the list of my rules to make the C++ coding life sweet and easy. This is simple convention to follow and can be adopted very fast. 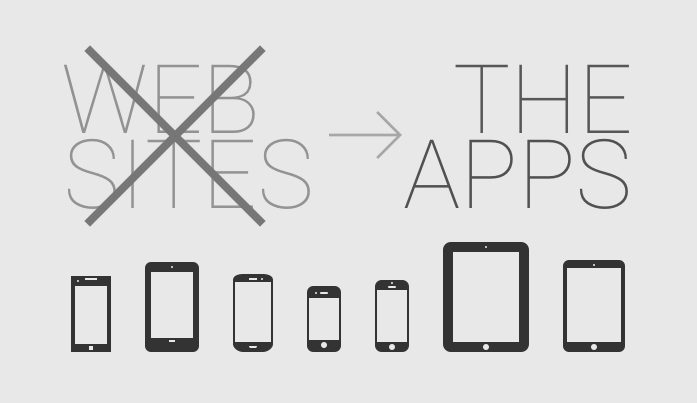 Not only it gives more stable implementation but also more clean and understandable design. This convention is composition of Scott Meyers rules, Functional programming ideas and reducing-complexity ideology by Steve McConnell. This entry was posted in Architecture, C++, C++11, Design patterns on 13 January, 2015 by Victor Laskin. 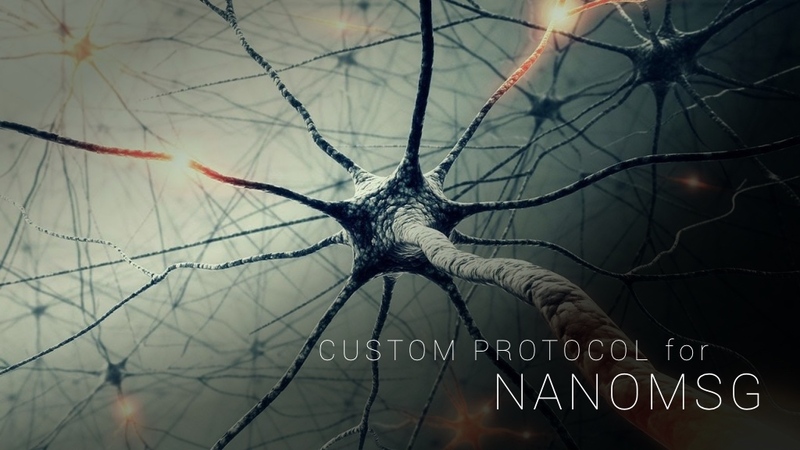 Nanomsg is next version of ZeroMQ lib, providing smart cross-platform sockets for implementation of distributed architectures. Here you can find basic examples of included protocols (communication patterns). Lib is simple (written in pure C) and does not have any dependencies like boost. And as this is at least 3rd iteration from same author you can expect some quality/performance here. This is kind of solution for the hell of writing of your own serious socket server. If you already had such experience you should understand the range of problems which are not so obvious at start. But here we expect to skip all such problems and go straight to processing messages. Lib handles automatic reconnection in case of link disconnects, nonblocking receiving/sending, sockets which can handle large set of clients, etc. All this seems like perfect solution for server-side inner transport of fast distributed architectures. But i also want to try it outside. The basic communication patterns (PAIR, BUS, REQREP, PUBSUB, PIPELINE, SURVEY) may fit large set of inner server transport schemes, but there are some minor limits in current implementation for client side application. I mean limits of protocols, not the lib itself. This entry was posted in Architecture, C++, Distributed solutions, Docker on 9 December, 2014 by Victor Laskin. 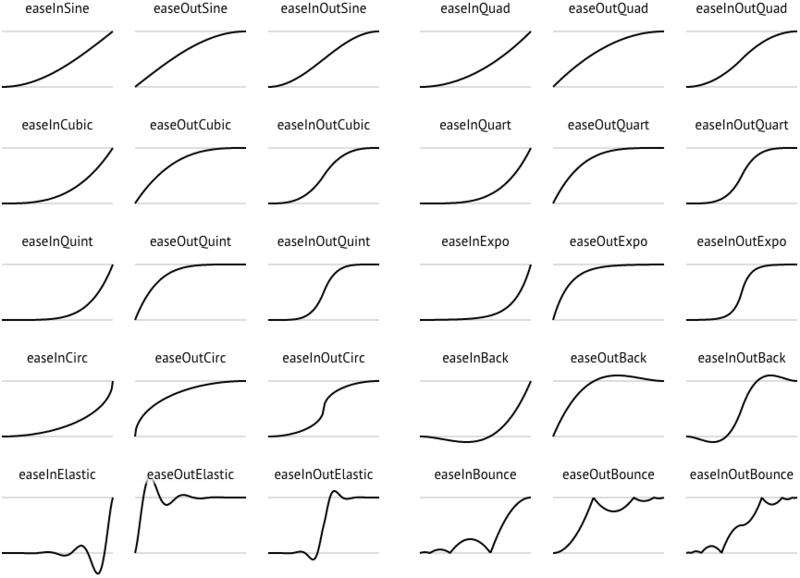 Today’s design guidelines state that all animated movement inside your application should contain so called easing. You can read this section from google material design. If your UI-framework does not contain implementations for standard set of easings you can create your own. Here is place where you can check out animated plottings for basic easing functions. And here you can find source code for them in several languages (JS,Java,Lua,C#,C++,C). This entry was posted in C++, Design, Math, Mobile development, UX on 27 November, 2014 by Victor Laskin. Here I will try to describe the concept of CQRS without event sourcing based on some other principle instead. The concept to organise your data and messages to create scalable and reliable CQRS/Messaging-based architecture without additional complexity from event store. At first here is small introduction on what SQRS is. 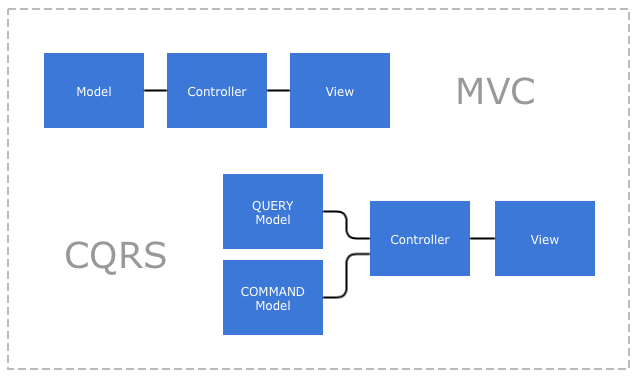 I suppose you are familiar with MVC model and use it on daily basis. And i suppose you understand benefits of separation your code into separate modules. CQRS – Command-Query Responsibility Segregation. CQRS just separates model into 2 separate parts – READS model and WRITES model. They also can be referenced as Query model and Command model. This entry was posted in Architecture, Design patterns on 6 November, 2014 by Victor Laskin. 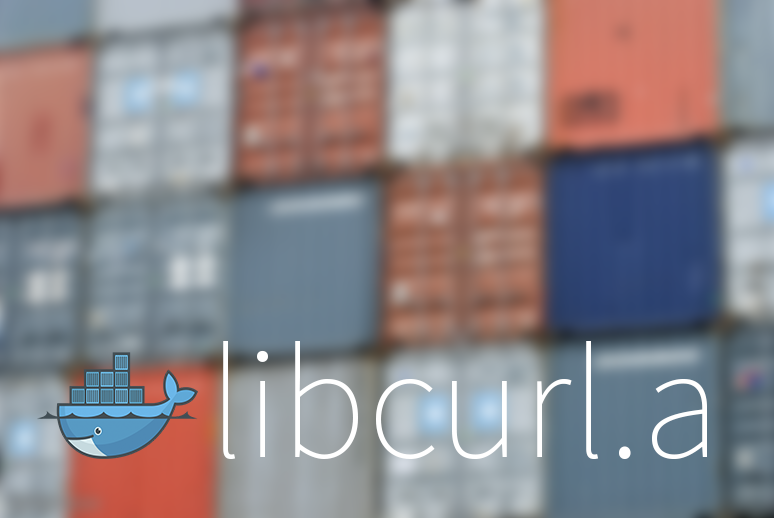 Update: 5 july 2015 – See updated version of dockerfile at the end of post with new NDK / SSL / clang toolchain. If you never heard of Docker be sure to check it out as fast as possible. There are lot of publications out there. At first it looks like another virtualisation software but it is actually more like new paradigm. Someone may call it very advanced chroot, someone may call virtual containers with version control and building scripts, and so on. I like it as the idea of application-centric containers – your application can keep whole operating system as a coating and its making perfect separation from outside influence. As well you can easily reproduce production process environment at another location. It makes virtualisation easy and fun. Almost everything can be done inside containers now. Recently i had to recompile curl for Android as static lib using latest NDK toolchain. Its not so complicated to do on your local machine (if it is not Windows) but now there is a more clean way to do this time-wasting operation. You can go to digital ocean, create droplet with Docker and using Dockerfile from the end of this post compile it while drinking coffee. This entry was posted in Android, C++, Docker, Mobile development on 28 October, 2014 by Victor Laskin. Watchman will call upload script for each modified file – lets write this script and call it uploadauto.sh. It will be really short! Replace here /Users/me/project1 with your folder name. upload is the name of the trigger. ‘*. *’ is the mask for files to be monitored. More information about trigger syntax can be found here. This entry was posted in Applications, Coding on 2 October, 2014 by Victor Laskin. Is 4K TV effective for software development? Until recent time i thought that developer who tried 2x 24 inch fullhd monitors will stay with this setup as must have option for more productive work. (If you still below this setup you must be located at the beach, drink some cocktails and just cant bring monitors with you.) 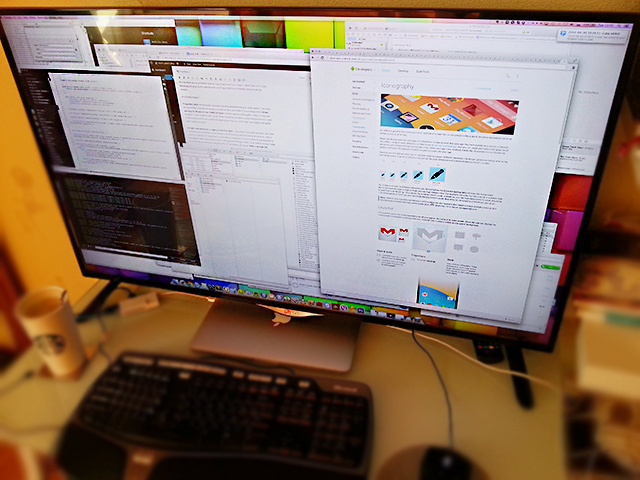 But now is the time to move further upgrading your workplace – now i use 4K 42-inch TV for development. Why now? In 2014 manufacturers released new cheap UHD devices in range between 39-42 inches. And by cheap i mean less than 1000 USD (I bought some LG 42UB820V model as it had IPS lcd and HDMI 2.0). Only 4K UHD resolution makes 72dpi and can be used as “normal” computer monitor when you sit close to it. This entry was posted in Coding on 30 September, 2014 by Victor Laskin. 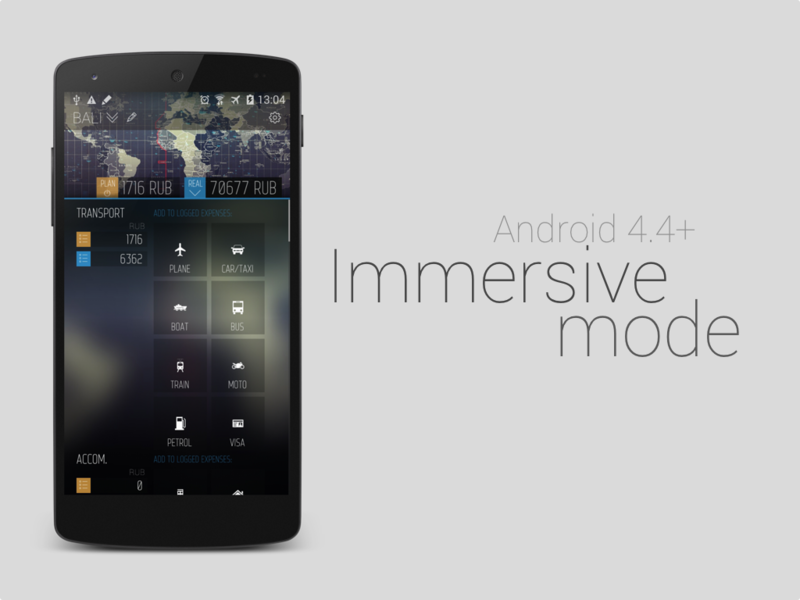 In Android 4.4 version we have new Immersive mode which allows to make system bars translucent and extend application area to fit all screen. This looks great as it gives more space to application in terms of usability and it creates more stylish look if application design is done accordingly. I added support of immersive mode to TripBudget. And there were some unexpected troubles on the way so i decided to write some kind of guide here. Note: I talk here about immersive mode where bottom navigation bar is hidden – using SYSTEM_UI_FLAG_IMMERSIVE_STICKY flag. This guide is aimed to gather and solve all problems which prevent sticky mode to work properly. This entry was posted in Android, Applications, Coding, Mobile development on 19 June, 2014 by Victor Laskin. Here are some thoughts on future shift from old html web sites to new native application format, which we are experiencing at mobile segment right now. This entry was posted in Android, Applications, iOS, Kobald, Mobile development, Uncategorized on 3 June, 2014 by Victor Laskin.